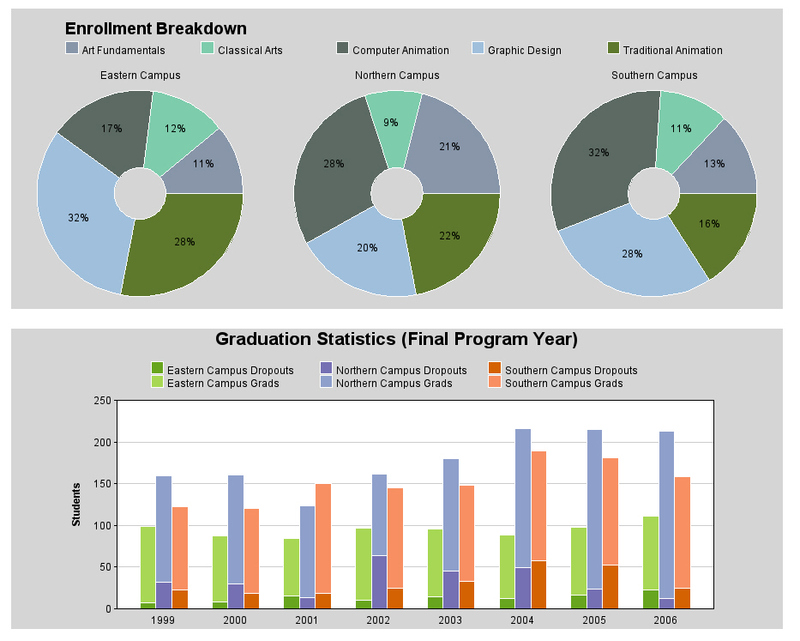 Data Dashboards Crash into Education – Will It Matter? Soon may be sepia-toned memory the professional development days when groups of number-phobic teachers sit around a spreadsheet attempting to divine something about their practice from the non-existent causation patterns they conjure out of the data presented to them. The data dashboard, a tool that has been employed for twenty years by the business community to assist in making evidence-based decisions, is on its way to education. Generous federal grants have inspired the development of these integrative data analysis systems for the education community, and the first principal and teacher-friendly products are now hitting the K12 market. The data available to school leaders since the initiation of our current Elementary and Secondary Education Act are overwhelming. Add to the myriad bits of digitized information schools maintain locally in student information systems (SIS), financial information systems (FIS), enterprise resource planning (ERP) systems, and several other databases managed by each school district, scores from standardized tests that are fed back to schools from state aggregators. This an overwhelming sea of data. And most of it is completely ignored. The different tasks of the principal and the teacher share one thing in common. Both are so all-consuming that synthesis of multiple sources of data to create an emergent course of action is not possible for either of them. The dashboard presents a synthesis of this data in a form that allows even the quant-phobic among us to recognize actionable trends. Education data dashboards are now hitting the market that will alert a principal when a subgroup of students shows absenteeism at a statistically significant rate, identify when a teacher improves student test scores on a standard metric from one year to the next, and draw attention to budgets that are being depleted at an unsustainable rate. A public interface for a school’s dashboard could feed parents real-time information about the performance of their children. Transparency could facilitate better public understanding of the needs any given community might have. The author of The Education Dashboard report even suggests that dashboards could make possible this Brave New World scenario.. This is all very exciting, but we need to be careful about how we are defining success. Right now in every state in the nation, one of the major components for how we judge success is the bubble test. This is a response to No Child Left Behind. States inadequately designed systems to meet the testing and reporting components of the law. Inertia kept these cobbled together systems in place, and a downturn in the economy is providing little opportunity for improvement. Quality assessment requires students to write and professionals to score that writing. Better yet, authentic assessments allow students to improve upon there work over time, cataloguing it in a portfolio, and maybe even presenting the work to an assessment team. This would be difficult, but not impossible to record in a database that a dashboard could see. And without quality data like this entering our databases an old adage comes to mind, garbage in, garbage out. Additionally, though the dashboard may provide us with synthesized data that suggest relationships, this little knowledge can be a dangerous thing. Imagine an administrator that sees a strong quantitative correlation between an excessive number of snow days and student performance on math curriculum taught during winter quarter. Meanwhile, two stellar math teachers who had babies over Christmas break and went on maternity leave were replaced by poorly trained substitutes. The administrator would probably be better spending his or her time making sure that the two new mothers knew how sorely they were missed, rather than lobbying the county department of transportation for more snow plows. Dashboards in education will offer us an opportunity to spend more time thinking about what data trends tell us rather than trying to find the trends in the first place. Solve all of our education woes, they will not. In any case, I look forward to professional development days where all of the teachers organize a fundraiser to help the county pay for more snow plows. Jack, thank you for this honest post regarding dashboards. Many evenings after looking at 4 or 5 different databases to gather information about my students I have longed for an updated dashboard waiting for me when I turned on my classroom computer each day. Although I will still take the dashboard over my current paradigm, if for nothing more than keeping me from having to remember 5 different passwords and logins, we must never forget that what us teachers do is founded upon interpersonal relationships. Thanks again! I appreciate how you weave the teacher’s reality in with emerging edtech possibility.